As newsreel producer Philip Van Zandt concludes his mission directive to boy reporter Jerry Thompson, we boldly SMASH CUT to a poster of Susan Alexander Kane lit by thunderbolt. Editor Robert Wise ruptures the movie’s zombie-slow forward shuffle at several points, the most famous being the screeching parrot with the see-through eye. This is the first, unless we count the eruptions of News on the March. 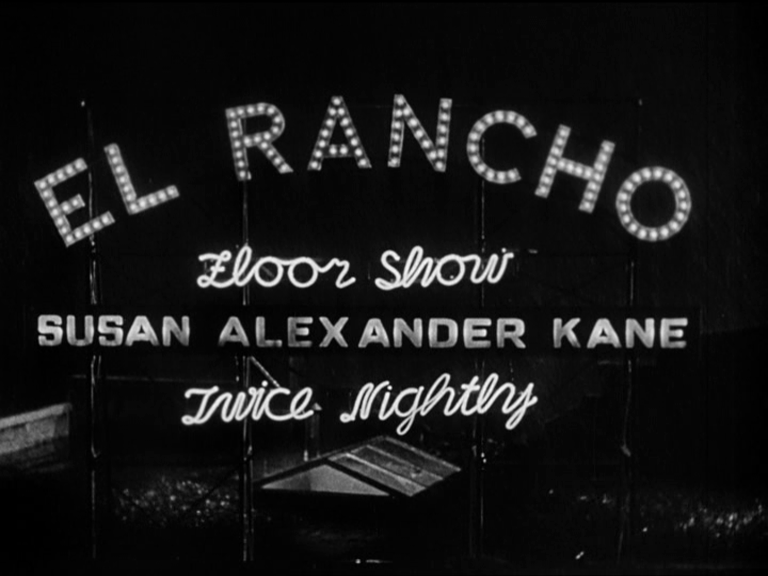 As Toland cranes up the wall of the El Rancho night club, we ask: “How many hidden transitions has Vernon L. Walker hidden in this shot?” And the answer comes back, “As many as he wants.” Since his revelations to the BBC about adding optical pans wipes and zooms into the film at Welles’ behest, we can no longer take on faith the actuality of any of Welles’ long takes. Andre Bazin spins in his grave until he starts to drill his way through the earth, tunneling under the surface until he hits a six-foot hill and emerges into daylight, a spinning mummy. Welles from the very start was disproving the reality of the long take. 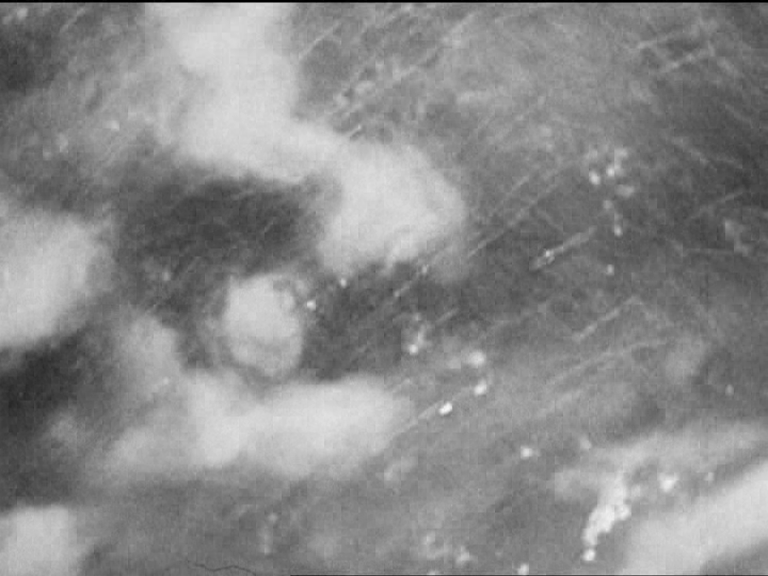 And then the electric eye attempts to pass through the El Rancho skylight and Walker’s optical solution is probably the worst effect in the film, setting aside that parrot’s missing eyeball. He seems to be trying everything he can think of to tie together the overhead view through the rain-soaked glass with the not-sufficiently-similar crane shot down onto Susan Alexander’s table inside. Rather than the plethora of techniques used — an initial dissolve to get us closer to the glass, half-heartedly disguised by a lightning flash — an optical focus-pull to blur the image — an interpolated ECU of rain-on-pane slung in for God knows what desperate reason (in fairness, probably because the rain on the miniature skylight probably made the shot look like a miniature) — when really one good idea (like whiting the screen out completely for a few frames with lightning zap) would probably have done it. Walker remained embarrassed by the transition, and the praise heaped upon it, throughout his life. We’ll have many more opportunities to examine his more impressive work elsewhere as we sidle through KANE. At some point before the skylight transition, Herrmann’s score has undergone a more successful segue, from the low sonorities of the Kane theme to a warbly, distant sax and clarinet torch song which toots aimlessly in the background, eventually shading in a xylophonic hallucination, occasionally interrupted by echoing thundersheet booms, giving the El Rancho an appropriately haunted, disconsolate atmosphere. (Soon, we are told, Nat “King” Cole will join the ensemble on piano.) The cactus-and-butte themed mural suggests a cheap movie, something many of KANE’s scenes evoke without ever making the film seem LIKE a cheap movie. Gus Schilling, a Welles favourite, plays the headwaiter. He has a face just made for standing over table lamps. Welles cast him as the porter in MACBETH, gave him his best role as Goldie in LADY FROM SHANGHAI, and his last role in TOUCH OF EVIL. Typed as a “nervous comedian,” here he’s discomfited by the fact that Susan Alexander Kane is sloshed as a newt and inclined to surliness. Note — when Dorothy Comingore as Susan Alexander asks for another highball, her delivery is too slurred to make out the headwaiter’s name. 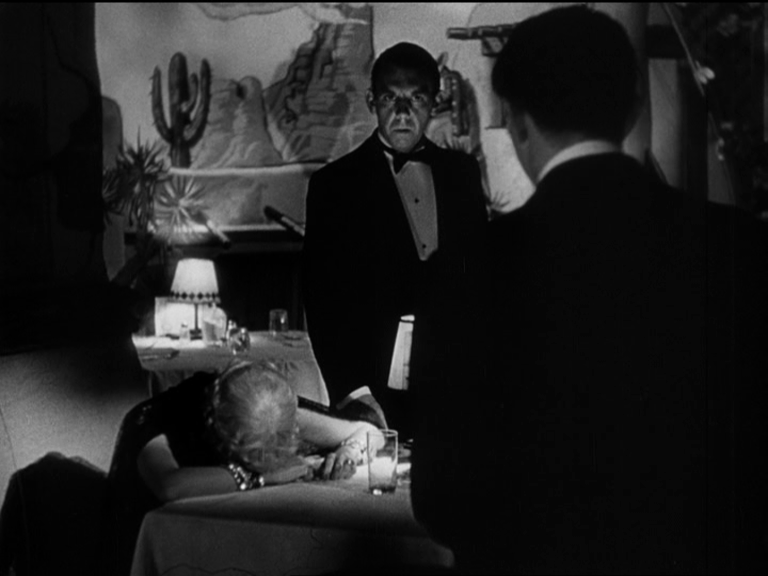 When Thompson addresses him later, he inserts a meaningful pause to get the guy to identify himself. “Josh,” volunteers Schilling’s character, but Thompson is too quick to reply, breaking in before he’s finished the syllable and calling him “John.” That overlapping dialogue will trip you every time. Incidentally, it’s a damn good thing SK holds off telling her side of the story until late in the picture — imagine those revelations coming at the start. We’d have the second wife before we’d met the first wife, we’d have Kane’s opera house building before we saw him get famous, and we’d probably have to show how Kane and Susan Alexander first met, a story Welles wisely gives to Jedediah Leland, who introduces it with just the right dry amusement — Susie will maintain her drunken bitterness by focusing only on the relationship’s sour conclusion. 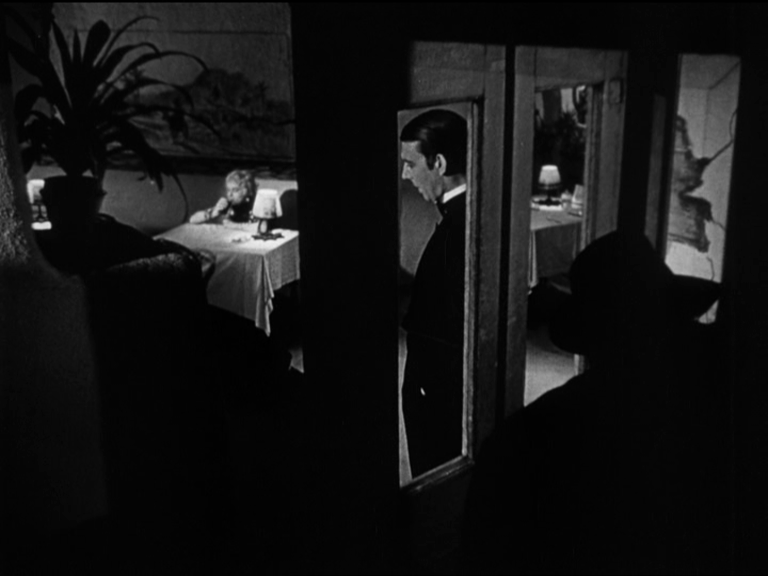 Amazing frame-within-the-frame fractured composition during Thompson’s phone call to his boss. Two spotlit areas sliced up by shadow, with Thompson himself a mere black hat, accorded equal prominence with a potted plant. I’d happily believe that the telephone he’s honking into is a cardboard cutout, but I fear it’s squandering a whole extra dimension by being real. “She never heard of Rosebud.” And — fade, The film’s first slow, more or less conventional transition allows us to feel that the plot has truly begun. Maybe something as recognizable as a First Act has been completed. Next: The Walter Parks Thatcher Memorial Library. This entry was posted on October 12, 2013 at 7:04 am and is filed under FILM, MUSIC with tags Bernard Herrmann, Citizen Kane, Dorothy Comingore, Gregg Toland, Mondo Kane, Nat "King" Cole, Orson Welles, RKO, Robert Wise, Vernon L Walker, William Alland. You can follow any responses to this entry through the RSS 2.0 feed. You can leave a response, or trackback from your own site. The jazz melody played somewhat softly in this scene pops up later in the flashback to the “picnic” Kane stages for Susan, when it’s seen and heard as a blues sung by a black performer who’s quite unlike Nat King Cole. David: I’m really enjoying your running Kane commentary- comparable to Durgnat’s at length discussion of Psycho. I was reminded of Kane’s lighting when I watched The Right Stuff last night on DVD, as my tribute to recently deceased fellow high school grad Scott Carpenter, In at least the first part Kaufman and Deschanel keep characters in darkness, though that could also be the lingering influence of Gordon Willis. Period critic Otis Ferguson though the most astute of his time didn’t get Kane: “Figures are in the dark for no reason.” Keep up the good work! Durgnat (mis)quotes me in his Psycho study! It’s my first moment in print. That’s a great one-line review from Ferguson! The whole of noir destroyed at a sweep. Love the Thorne connection. “The camera is an eye in the head of a poet,” indeed.